I had the pleasure to work with Rosemarie Montroy of Direct Media during my three year stint at my previous employer, and we really hit it off well. Her and her team did great work with our group as we resumed prospecting of the re-launched business, and the results helped give the fledgling company a firm foundation. She honored me by inviting me to speak at one of their client conferences on leveraging the web for new customer acquisition. Over this period we shared numerous meetings, laughs, drinks, and dinners, as well as a great partnership. Unfortunately, that all came to an end with my firing. Upon notification of the bad news, I immediately penned a note to all of my contacts and asked for their help in keeping their ears open for any opportunities. Mike, this is sorry news indeed but I am a firm believer that everything in the universe has a time, place and reason and there is a lot of positive energy around you, kiddo. I'll keep my eyes and ears open and, with your permission, pass this information along to my associates here at DMI. Let me know if that's ok.
Best regards ... I'll be in touch. Note the close. Not "keep in touch." Not "good luck." It was a firm "I'll be in touch." Two days later she had two opportunities, and signed off with "Keep the faith!" A day later another opportunity, with another "I'll be in touch." A day later, yet another opportunity. It turns out one of those contacts is now my current occupation. I am neither the direct response marketer, nor the business leader, nor the person I am today without the direct influence of Rosemarie. Unfortunately, I have found out that she has passed away recently after a very quick illness due to lung cancer at the young age of 64. 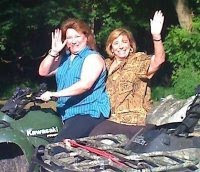 The picture of her above on the back of the ATV is one I took from her Facebook page, and is one that truly embodies her infectious spirit and love of life. Rest in peace, Rosemarie. And thank you. Thank you for everything.